Justice League is a regular column where global social issues are raised and various perspectives are explored. In this issue, TISH WORTON reveals just what goes into making the devices we couldn’t live without. Right now, my guess is your phone is within arm’s reach, or even in your hand. It’s your connection to the world. Admittedly, when I lose mine it’s like I’ve lost an extension of myself. That little device, however, is partially responsible for the death of almost 5.5 million people – the highest death toll of any conflict since WWII. Or, if you prefer animals to people, a part of your phone is rapidly culling gorillas. Have you ever heard of coltan? I hadn’t really; it even comes up with a squiggly red line when you type it in to a Word document, but it is in almost every single electronic device you own. Coltan is short for columbite-tantalite, a black, tar-like mineral generally found in the Democratic Republic of Congo (DRC). When coltan is refined it becomes a powder which is heat resistant and especially good at holding an electrical charge. Coltan is mined using a similar method to that of the gold miners we learnt about in Year Six Australian history. People wash the earth, then scoop up the mud and slosh it around a container so that the coltan falls to the bottom and the rest can be decanted off. The price of coltan varies depending on supply and demand – during a technological boom it has risen to US$600 per kilogram, but averages US$100 per kilogram. These high prices have meant that many of the DRC’s neighbouring countries (and resident warlords) have moved in to exploit the trade. According to an article from the American Broadcasting Association, “In Kahuzi Biega National Park… the gorilla population has been cut nearly in half, from 258 to 130”. Rebels and miners have cleared large quantities of rainforest in order to have greater access to coltan. Gorillas and many other animals have lost their habitats, and the national parks are shrinking as the Congolese government is too weak to protect them. Miners and rebels also hunt the gorillas for food, sold as ‘bush meat’. Many phone and computer recycling campaigns highlight the impact of coltan mining on gorillas and their habitats. One example is Fauna and Flora International, who partnered with UNSW in 2012 for a phone recycling initiative. Recycling your phone is a practical way you can reduce the coltan mined, and every little bit counts. In the documentary Blood Coltan, the mayor of a local town identifies two aspects of the problem coltan mining has created: “the political side, and the economic side”. The political side refers to the occupation of Congolese mines and land by non-Congolese people. In the documentary, we follow the journalists as they travel into land controlled by the FDLR (Democratic Forces for the Liberation of Rwanda), while still on Congolese soil. The villagers in the area live in fear of the militia group. These trespassers on national sovereignty tie into the economic problems. 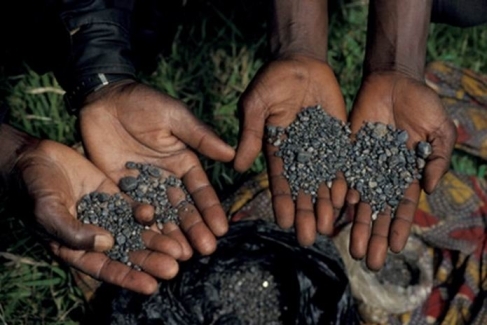 The FDLR seize the coltan and sell it for profit, giving little to the villagers, while also forcing them to pay taxes. In this way, the wealth of the DRC is not going to its people, but in fact to Rwanda, or any of the numerous other nations which have seized Congolese mines. It is estimated that in an 18 month period Rwanda made over $250 million from coltan, even though it is not mined within the country. This has been going on since 1994, and eleven years on from the period known as the ‘World Wars of Africa’, the DRC is still highly unstable. Many nations and militia groups are fighting over the coltan mines, including the Allied Democratic Forces (ADF), a Muslim group from Uganda; the Lord’s Resistance Army from Uganda; the Mai Mai militias from Congo (who are against the Congolese government and UN); the M23, a Tutsi-dominated group which recruits militia from DRC, Uganda and Rwanda; and the FDLR – a remnant of the Hutu people who committed the Rwandan genocide in 1994. Funding for these groups comes largely from the sales of coltan. During the wars it is estimated that 5.5 million people were killed. Militia groups murdered, raped, enslaved, and stole from the Congolese people, and continue to do so in areas uncontrolled by the Congolese government. However, in 2013 the United Nations were able to make significant progress through regional cooperation to defeat one of the rebel groups, the M23. The combined forces of the UN peacekeepers and Congolese army were able to overcome M23 forces late last year by attacking M23 strongholds until the militia group called for a cease-fire. As previous negotiations resumed, many of the members fled into neighbouring Uganda and were disbanded. Unfortunately, there are reports that the group are attempting to reform. Amongst all this murder and violence is the small black mineral, which sits like silt in muddy puddles. We, with our phones, iPods, and laptops, are so far removed from the chaos we help to fund. I’m writing this on my laptop now, and people died for the coltan that powered it. But this article isn’t a guilt trip. You can’t boycott technology, but you can be aware. If you ever see a ‘gorilla friendly’ phone, aim for that one. Foucault talks about how knowledge is power. I don’t think he particularly meant it in this sense, but if we spread awareness, then maybe someday we’ll have the power to make a change.